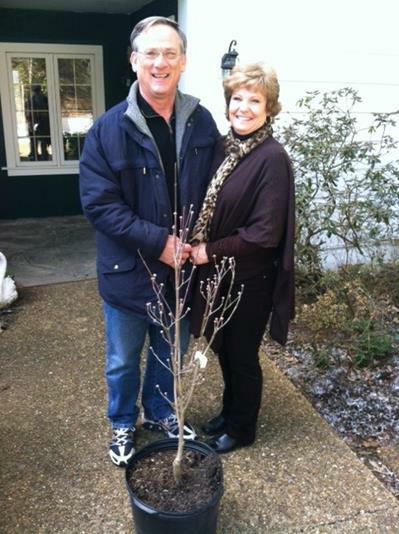 Ardent gardener Shan Smith and his wife Susan gave Buckhorn the perfect 75th birthday present—a Cloud 9 Dogwood. It’s perfect for many reasons but especially because our Founder Douglas Bebb discovered a new species of dogwood on the property forty years ago. He patented and named it Fragrant Cloud because, unusually for a dogwood, it was scented. Doug always said that for him, at least, money did grow on trees. John and I thank the Smiths and their family for the beautiful tree and their loyalty to Buckhorn. In early June, 1955, Peggy and I were married and honeymooned in Gatlinburg. Unfortunately, we did not know Buckhorn Inn existed. Fifty years later, in June of 2005, we were privileged to celebrate our 50th Wedding Anniversary at the Inn. It was idyllic, and, yes, romantic, even enchanting—a pleasant day followed by a beautiful star-lit evening as only the mountains can provide. The weather was cool and the soft crackling of a log fire added to the enchantment; the Mozart was serenely beautiful; the aromas of Country Granary bread blended with the herbs of the Beef Tenderloin whetted our appetites for the outstanding dinner. With the permission of the Innkeeper we shared Champagne so all the dinner guests joined in a toast which made it, for us, a memorable evening indeed. Since that occasion we have celebrated seven more anniversaries, all at the Inn. We, like the Inn, plan to have a unique event for our 75th birthday this year which, while special to us, will have to be special indeed to surpass the enchantment and fond memories of that 50th. The best thing about Mother’s Day is that on the next day, Monday, my three sisters and I pack up and head for Gatlinburg. For three nights our home away from home is the beautiful Buckhorn Inn. We spend our days eating, hiking, talking—and eating! Actually, we hike to eat. In the evening you will find us playing Scrabble or Skip-Bo downstairs in the Inn’s family room. If there are any brownies left from the afternoon, we might have to try one. (Did I mention we like to eat?) 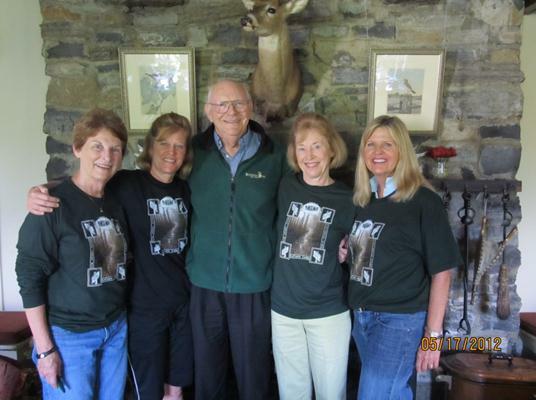 The innkeepers and staff treat us like family and the time we are there seems to fly by. We are always looking forward to next year and another stay. We are lucky to live close to each other and see each other often at home, but the time we spend together at Buckhorn in special. It is the place where, the year our Mom died, we sat at the porch and shared memories. Laughing and crying, we went through a few of her things and each chose a keepsake. And so, “God willing and the creek don’t rise,” the next Monday after Mother’s Day we will be back at our inn. Teller assumes a defensive stance to protect his mate Pentu during the mating season which begins around Valentine’s Day each year. 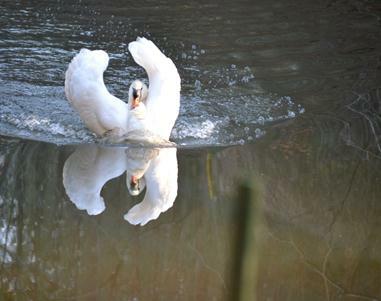 The pair has yet to produce progeny, but this may be the year. Eggs are usually laid in late April or early May. The gestation period is about 30 days. We are pleased to announce the winner of January’s Buckhorn Memories Contest—Elise and Lawrence from Knoxville, Tennessee who will receive a gift certificate for dinner for two the next time they are guests at the Inn. 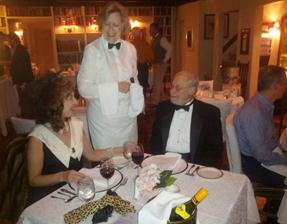 We thank them for their beautifully written and charming memory of a private night at Buckhorn Inn. We thank everyone who has submitted an entry—we treasure them (the entries and the folks who wrote them). To read all the entries that have been submitted, go to Buckhorn Memories category. And the contest does continue. Guests are invited to write about a memorable experience associated with a visit to Buckhorn Inn for a collection we plan to publish at the end of the year. You can write about your experience on this blog by commenting below or you can complete a Memory Card when you are a guest this year or you can write us a letter or send us an email. Each month we will select our favorite memory from those submitted and award a prize—dinner for two. At the end of the year, we will select a grand prize winner, awarding a complimentary two-night stay at Buckhorn. I wanted to share with you one of my most enjoyable moments during this most recent stay (Feb 4th-5th, 2013). Chad and I had spent a long morning on the slopes in Ober Gatlinburg along with a bit of ice skating and were headed back to the Inn for some R&R. We were both exhausted and wanted to rest on the beautiful veranda overlooking Mt. LeConté with our bottle of wine that we had purchased at a local winery in town. 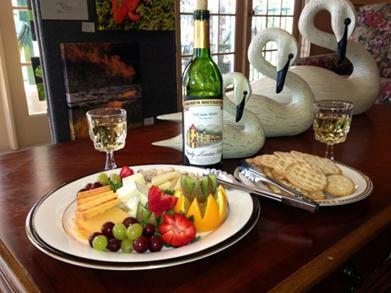 The only thing I could think about was how perfect a nice cheese & fruit tray would complement our wine selection! I immediately called the Inn and spoke with Debbie (Who is Amazing) on the way back to Buckhorn. She and Chef Frank took care of everything! We had our treat waiting for us upon arrival! What a perfect way to end a perfect day! Thank you once again for everything! This is why we always return. The opening event of Buckhorn Inn’s 75th Anniversary was held on Saturday, January 26. Our dining room was lit by the soft glow of candles and the warmth of a fire as guests sipped Bellinis and enjoyed a sumptuous dinner featuring an entrée of Peppercorn Crusted Filet Mignon with Brandy Cream Sauce and a dessert of Baked Alaska Flambe. Big band music set the mood perfectly. All guests joined in the spirit of the evening, some by donning clothing from the period. Prizes were awarded for Best Dressed Couple (see Jan and Ira Lapides above), Best Group of Men in Bowties (Messrs Hunt, Pendery, Plomin and Furr), Best Dressed Lady (Mrs. Plomin), Best Lady in a Ponytail Wearing a Hat (Mrs. Turner), Lady in the Most Authentic 1930’s Hat (Mrs. Terrell), and Most Attractive Man Wearing a Lady’s Hat (Mr. Franklin). We thank the sold out crowd for their enthusiastic launch of our Diamond Jubilee Year Celebration. Popular Cuisine of the 1930s and 40s. We recently had the pleasure of welcoming the granddaughter of Rachael Young as a guest of the Inn. 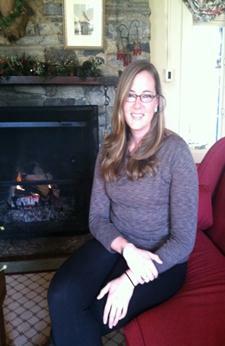 Katherine has been visiting the inn all her life, as her grandparents and her great uncle owned the inn for 20 years. We always like to see her at Buckhorn and especially in this year when we are celebrating our Diamond Jubilee–aka our 75th Anniversary!